Generally, people don’t seem to be crazy about spending too much time with car salespeople, and I’m going to go out on a limb and say that doesn’t get any better if they’re forced to against their will. And yet, somehow, that seems to be what happened in Chattanooga, Tennessee, when a Chevrolet dealer salesman allegedly kidnapped a disabled man who brought in his truck for service. 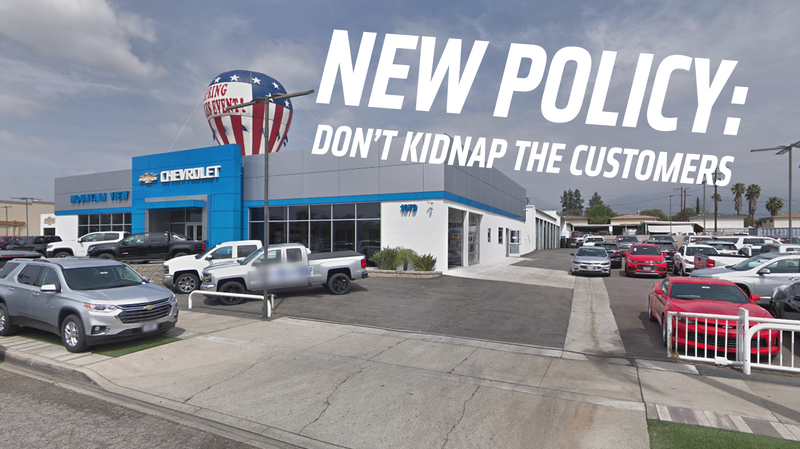 The salesman in question is Daniel Bryant, a now-former employee of Mountain View Chevrolet whom the FBI is currently seeking a warrant to seize his bank account, as it allegedly contains nearly $200,000 of money extorted from a customer. The customer had been involved in an on-the-job accident, resulting in the loss of a leg and partial paralysis. The customer had purchased a truck with some of the money he received from the “substantial financial settlement” resulting from the accident, and had returned to the dealership to have the truck serviced. Bryant offered to drive the man home after dropping off the truck, but instead Bryant allegedly held the man against his will for two days, where he took him to a hotel in Georgia, took him to banks to get cashier’s checks to give to Bryant under threat of physical harm and even death, and, most puzzlingly, forced the man to smoke crack. The victim eventually was able to contact police when he entered, with a family member, a Bank of America branch and told staff that he needed police assistance. I’m guessing the victim’s eventual Yelp review of the dealership won’t be terribly good.